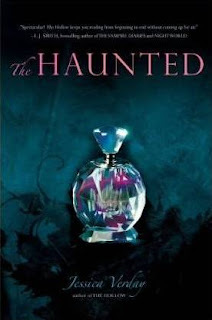 blo Teens Read and Write: THE HAUNTED - Excerpt and Perfume Giveaway! 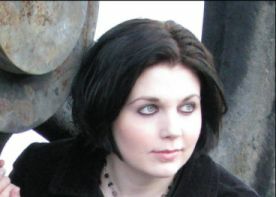 We're happy to be part of Jessica Verday's tour for THE HAUNTED, the highly anticipated sequel to THE HOLLOW. To kick things off we have an excerpt (copyright by Jessica Verday) for you to enjoy! The review will be up on Thursday AND Jessica has generously provided a vial of her perfume, CASPIAN, for a giveaway! Squeezing my eyes tightly shut, I choked back tears. Did this mean I was still crazy? That I always was? “Caspian…,” I heard myself whisper. He didn’t respond, but there was a rustling sound, and I opened my eyes again. Grabbing on to the tree for support, I stopped myself from pitching over. I cursed as I saw everything so clearly. It was happening again. “I thought you’d be mad that I lied about not loving you,” he said softly. He nodded, and the stripe of black hair that normally angled across his forehead fell into one eye. “You love me?” I whispered. “If you’re mad, be mad,” Caspian said. “I’ll take that over…” He shook his head. “The last time I saw you, I thought I…broke you, Abbey.” His voice came out in a whisper. Thanks Jessica and be sure to check out the review on Thursday! PS How is everything going with your home? I tried reading the first one and got bored 100 pages into it. The second book sounds good, tho. I need to buy that book soon. I'll have to read this one. It sounds interesting. This is a new one for me, I would love to read it. I don't think I've heard of this before either but it sounds great. Haven't read the hollow yet, but can't wait to read. The main character of this book has the same name as me, and it's even spelled the same!! First time I've ever had that happen to me! This book must be a winner! I loved book one and am anxious to get my hands on this one soon! I really do have to get The Hollow! This sounds like the sequel will be really neat. Havent had time to read the second book but i cried in the first book when Abbey left. Unique and awesome giveaway. Book sounds good.